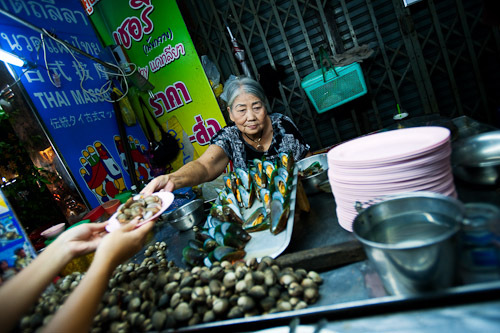 For the last 30 years, Pa Jin has been selling cooked cockles and mussels from a stall on a busy street in the centre of Bangkok's Chinatown. The relatively expensive price of 100B (about US$3) per plate belies the fact that you're sitting on a stool sucking car exhaust, but her unique cooking technique and good-quality raw ingredients make it worth it. Rather than steam them, Pa Jin dips the cockles into a medium-sized pot of boiling water until they're just about to open - probably no more than 15 seconds. She then meticulously pries each one open by hand. The barely-cooked meat that emerges is tender and velvety, lacking the rubberiness of overcooked shellfish. 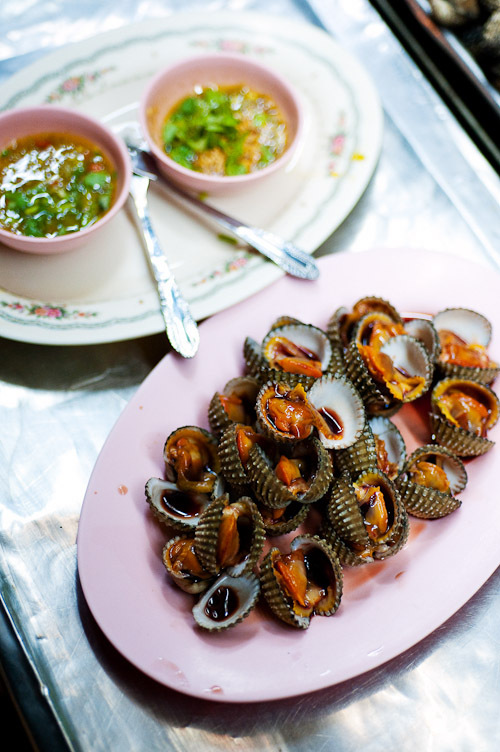 The mussels, which have been pre-boiled, are also pretty good, and to order are briefly submerged in the same water. Both are served with three kinds of dipping sauces (one order of dipping sauce is 'single', two is 'in love' and three is 'family') that run the gamut from tart/spicy to sweet. And of course, Pa Jin has a website and a 'Call Center', the latter ostensibly for urgent cockle-related issues and/or emergencies.